← Will People Worship Anything Entertaining? In public media and private conversations, one often hears the argument that science is just another religion. This is a powerful allegation. It levels the playing field. It says, essentially, everybody is entitled to an opinion, and you don’t have any more basis for yours than I do for mine. The problem is this: Those who preach that science is a religion fundamentally misunderstand the nature of science. First, they equate science with a body of content, a collection of statements about what is real. Second, they assume that scientists arrive at their conclusions in the same way that believers do: by embracing a set of beliefs and then seeking evidence that they are true. Both of these assumptions are wrong. Scientific discoveries or conclusions are the public face of science. They get written into textbooks and popular books. They provide interesting material for the Discovery Channel and magazines like National Geographic or New Scientist. They guide our decisions about which medicines to take, which foods to eat, and which industrial chemicals to avoid. But at its heart science is not a set of answers. It is a method of asking questions. The genie-like power in the scientific method of inquiry, the reason it has allowed us to develop Advil and five pound tomatoes and silicon chips, comes from something very small and simple. The scientific method pits itself against one of the most basic human mental weaknesses. Let’s look first at this weakness and then at what science does to guard against it. All human beings are beings are vulnerable to what psychologists call a "confirmatory bias." This means that we all have a tendency, almost a compulsion, to seek information that confirms what we believe to be true. Without even trying to, we behave like defense attorneys rather than impartial judges. We look for information that fits our views, we remember it better than contradictory information, and we are more easily able to retrieve it from memory than information that might challenge us. The brain is like a good lawyer: given any set of interests to defend, it sets about convincing the world of their moral and logical worth, regardless of whether they in fact have any of either. Like a lawyer, the human brain wants victory, not truth; and, like a lawyer, it is sometimes more admirable for skill than for virtue. Almost forty years ago, researchers showed two groups of college students a movie of a baby dressed in unisex clothing. The students watched the child play. Some were told the baby was named Dana, others that the name was David. The students who thought the baby was a girl saw a child who was sensitive and timid. Those who thought the baby was a boy saw a child who was strong and bold. Later experiments have shown that human adults can detect real differences in the temperaments of babies. But having a prior belief interferes with our ability to see what’s real. Was Dana/David on the sensitive, timid end of the spectrum or on the strong, bold end? We don’t know. But we do know that one of those groups of college students got mislead by what they thought they knew about the baby’s gender. In another study, people with strong opinions on a social issue were presented with four arguments related to the issue in question, two for and two against. One of the arguments on each side was reasonable and the other was so unreasonable as to be ridiculous. Later, people were asked to recall all they could of the four arguments. Guess what they remembered best: the reasonable arguments in support of their position and the pathetic arguments against it. It is easy to see how this might lead to a skewed sense of reality. If you are fortunate enough to start with accurate assumptions, you may get lucky following a confirmatory path. But, like Alice-in-Wonderland, if you start with ideas that are in any way off-target and then you only look for signs that lead in the same direction you can end up deep in a rabbit hole. How does science pit itself against our powerful confirmatory bias? How does it help to keeps us out of mental rabbit holes? By forcing us to ask the questions that could show us wrong. A more formal way to say this is that scientific inquiry is built around asking disconfirmatory questions. Imagine that Joe Jones thinks horse manure is the best fertilizer available for raising those five pound tomatoes mentioned earlier, and he wants us all to think the same. Now, if Joe is simply an ordinary guy with a passion for horses or fertilizer or tomatoes, he might simply point out all of the amazing tomatoes that he and others have grown in horse manure. Or he might call attention to wimpy little tomatoes that were grown by a neighbor who used a competing fertilizer. Being human, Joe will be inclined to overlook his own tomatoes that don’t reach the five pound mark or the particularly huge tomatoes that he heard were growing just down the road. He may forget to mention, even to himself, that he and his neighbor started with different seeds or had different watering schedules. If Joe is a manure salesman for a big horse barn, he will be even more inclined to distort the facts in this way. Even if he is a basically honest guy, he may fall prey to confirmatory bias. If Joe is a scientist as well as a passionate believer in the value of horse manure, he will be inclined to distort things in the same way. Scientists, after all, are human too. But unless he wants to face ridicule from his peers, he doesn’t dare tout the values of horse manure without doing a little more work. He has to ask himself: What if I am wrong and the awesome size of my tomatoes really is due to better light or seeds or water? I think it’s the horse manure, but what tests can I set up that would catch me if I’m mistaken? He must then design an experiment that compares several sets of tomato plants. Each set, to the best of Joe’s ability, must be exactly the same in every way except that one set gets horse manure and the others get the best competing fertilizers. This is a silly example, but all scientific inquiry, however complex, is built around similar principles. If you think something is true, if you have a hypothesis that it is true, you have to submit your hypothesis to tests that could show you wrong. Science has a bunch of technical words and procedures that guide the way experiments are done. But they all come down to one thing: setting the traps that will catch us when we’re wrong. If a statement is not falsifiable, if there is no way to show it wrong, then scientists won’t touch it. They are not allowed to make claims about reality that are not subject to these rules of evidence. Scientists are often wrong– sometimes because they misread the evidence, sometimes because they fail to ask all the questions that could show them wrong, sometimes because new technologies let us ask more questions, and sometimes because they so much want something to be true that they fall into confirmatory thinking in spite of all of the safeguards that the scientific method puts into place. But the great thing about scientific inquiry is that sooner or later, they get discovered. People don’t just test hypotheses once; they test them over and over. One of the rules of science is that the tests have to be replicable. That means, someone else has to be able to do the test and come up with the same answers. It is hard to stay wrong for thousands of years when people keep asking the questions that have the power to expose their errors. Scientific findings are simply hypotheses that have survived so many tests that doing more tests would be boring; nobody can even imagine a valid test that would produce different results. When a hypothesis has been tested this thoroughly, it gets treated as a fact. But scientific "facts" are tentative. If something is thought to be a fact and later is discovered to be wrong, science gets to work adjusting. Admitting you are wrong can be embarrassing. People try to wiggle out of it in all kinds of ways. But those are the rules. Science itself isn’t threatened by these discoveries. They are to be expected. They mean that the scientific method is working. How is this different than religion? Traditionally, religions and other faith-based ideologies take a very different approach when it comes to deciding what is real and true. They start with a set of statements about reality and then work backwards from there, searching for evidence to support these beliefs. The beliefs, also known as doctrines or dogmas, put limits on what kind of evidence is allowable and which basic assumptions can be questioned. In other words, religions actually advocate a confirmatory strategy when it comes to their basic beliefs. Be fully persuaded that an adequate explanation exists, even though you have not yet found it. . . . Once we have come into agreement with Jesus that the Scripture is completely trustworthy and authoritative, then it is out of the question for us to shift over to the opposite assumption, that the Bible is only the errant record of fallible men as they wrote about God. It is a little puzzling that Archer talks about coming into agreement with Jesus, since the New Testament was not written when Jesus was alive. Nevertheless, Archer’s point is clear. You must decide, first, that only a certain kind of explanations are possible –those in keeping with the Evangelical belief that the Protestant Bible is the literally perfect word of the Evangelical God. Then, the right approach to biblical difficulties is to search for explanations and evidence that support this point of view. Archer’s statement helps us to see the essential difference between religion and science. The heart of science is a process, a method of inquiry that then generates tentative statements about what is real. Science is not threatened if some of its statements are wrong. In fact, this is expected to be the case. On the other hand, scientists would be quite worried if someone could argue successfully that the scientific method itself was flawed. For religion, the opposite is true. The heart of religion is not a process but a set of content – statements that are held to be absolutely true. Religion is not particularly concerned about how one defends these statements, and many processes or kinds of evidence are accepted: logic, experience, intuition, visions, or even dreams. A religion is threatened only if its beliefs are wrong. From this basic difference, process at the core versus content at the core, come other key differences between science and religion. For science, the thing that has stayed the same for a thousand years is the process of asking questions. Although methods have been refined and more safeguards put in place, the hypothesis testing that is done by a modern physicist is essentially the same as the hypothesis testing that was done in the time of Copernicus or Galileo. But the findings of science have been corrected many times. For religion, the thing that has stayed the same for thousands of years is content, or basic beliefs. The arguments or evidence defending this content can change, but basic doctrines of Hindus or Muslims or Christians today are mostly the same as they were a thousand years ago. Understanding that science is defined by process and religion is defined by content also helps us to understand the criticisms that scientists and religionists hurl at each other. Consider, for example, the recent battles between evolutionary biologists and fundamentalists from the three Abrahamic religions (Christianity, Islam, and Judaism). The biologists stand by their findings because no one has argued convincingly that their methods are flawed. On the other hand, they are highly critical of the methods used by their opponents, insisting, for example, that creationism or intelligent design is not science. The religionists, on the other hand, insist that science itself is flawed because its findings are wrong. The process must be a bad one because it is not producing statements that line up with what they believe to be real. Understanding the difference between science and religion can also help us to distinguish the appropriate role of each. Science has no means of making statements about questions that are outside the realm of its defining process. If we have no way to test a question, either with logic or evidence, then science cannot address it. Science, for example, cannot tell us what to value. We must make those decisions individually and together. This is why ethical discussions about science must involve both scientists and experts in other fields. It is why government bodies must make judgments about which uses of technology will get public support and even which will be illegal. Whether we can do something and whether we should are two different questions. Once we decide what is important, then science can provide us with crucial information about which course of action is most likely to help us meet our goals. Outside this territory, those who speak for science are on shaky ground. In the Sanskrit tradition of Buddhism, if the Buddhist finds traditions that contradict the evidence, then those parts of the tradition need to be rejected, or interpreted differently. The tradition believes there is a liberty to change that which contradicts reality. a religious answer which does not destroy reason but points to the depth of reason; which does not teach the supernatural, but points to the mystery in the ground of the natural . . . which knows about the significance of symbols in myth and cult, but resists the distortion of symbols into statements of knowledge which necessarily conflict with scientific knowledge. Episcopal bishop and author John Shelby Spong explores similar questions in his book, A New Christianity for a New Age. Other cautious religious scholars suggest that religion, at its deepest, seeks humbly to channel our moral yearnings, our sense of wonder and joy, and our desire to make meaning out of life and death. Calling science a religion makes it both smaller and larger than it is. It denigrates the unique power of science to uncover the cause and effect relationships that govern the world around us—the contingencies that have shaped our past and will shape our future. It also fails to recognize the limits of any method of inquiry. There will always be questions that we simply must ask our hearts. There will always be questions we cannot answer. And their will always be a need for random acts of kindness, senseless beauty, and wise decisions in the absence of certainty. 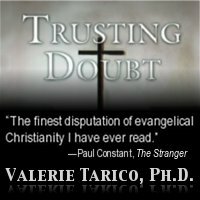 Valerie Tarico, Ph.D. is a psychologist and freelance writer in Seattle, Washington. She is the author of The Dark Side: How Evangelical Teachings Corrupt Love and Truth. 4 Responses to Is Science Merely Another Religion? Now, a lot of this stated as truth is opinion. That’s a fact. Now, a lot of this stated as truth is opinion. Thanks Valerie and the rest of you for making a stand as we reason together. My challenge has been to work within the Evangelical church community. I have found that there is much openness toward my approach since I am respected for my knowledge of the Bible. Although I sometimes get in the face of those who come on strong (this comes from a combination of my Italian heritage, Marine training, and 4th degree black belt in TaeKwon-Do). However, the times when I come on strong are less than those when I patiently present the truth as I know it. Several wise teachers have taught me the flaws of fundamentalism without necessitating going to the other extremes. It is possible to tackle major issues related to "The Dark Side . . . " of evangelical fundamentalism without losing that which has value within the Holy Scripture. Yesterday, for example, I was in an evangelical church explaining how John 3:16 has been twisted throughout 2 millenia to scare the hell out of people unless they accept the church’s message, how John 14 has been used to promote exclusivism and market Jesus as a brand, and why "Christians" don’t have a monopoly on the Holy Spirit. Frankly, most evangelicals are very nice people and a few of them are diligently seeking truth. I have been blessed with knowing quite a few of them. I also love agnostics and atheists because they usually have more rational thought than "true believers." Like Jesus (see comments on the 7 churches in Revelation chapters 2 and 3, religionists make me feel like throwing up. Today many evangelical churches are following a model that has little or no relationship to who and what Jesus and his disciples were and did. Today’s evangelical approach is a composite of secular marketing and branding, using survey metrics to identify needs, promoting a watered down version of adult ed programming, sprinking in a few tidbits of Bible verses that are limited to approximately a 4th grade level, and either passively or actively (depending on the group) fighting any scientific findings that disagree with their preconceptions while they masquerade as theological logicians interested in the welfare of their members. All of this is orchestrated by CEOs rather than pastors. This will eventually be seen by the IRS as a darn good reason for taking away their tax exempt status. I love my work and fully realize why God put me through Marine Corps boot camp prior to my seminary work when I have to deal with the brainwashed hard liners. The joy comes from working with those who truly desire to seek and practice truth in their lives. All the best in this quest.